Amidst rapid growth in the number of palliative care programs, the December 2017 issue of the Journal of Palliative Medicine calls for a pause to consider the blueprints for how we build moving forward. In the issue, Kousaie and von Gunten (2017) compare two hospitals, one that has an established advanced practice nurse only model of palliative care delivery (APN model), and a second hospital implementing an interdisciplinary team including physicians, APNs, social workers, chaplains, and pharmacists (team model) for the same purpose. Compared to the APN model, Kousaie and von Gunten report that the team model reduces length of stay and increases cost savings. At this moment, there is value in reflecting and evaluating the current practice of palliative care in order to build a better future, including the impact of the composition of palliative care delivery teams. However, we have a number of concerns with the methodological approach to this study and the conclusions drawn from its data. Of primary importance, the conclusions of this study warrant further scrutiny. In explaining the outcomes described above, the authors suggest that differences in communication styles may play a role, observing that while the APN model tended toward “indirect” interactions with consulting teams, the interdisciplinary team “directly” engaged the consulting team to alter the plan of care more frequently. However, the research design and data do not offer enough support for this conclusion. First, without outlined details on study design, to which a qualitative study would be well suited, it is unclear exactly how the teams were observed. Second, when reporting observed differences in communication, the authors describe the interdisciplinary team as “the team with the physicians.” This seems to imply that the observed differences in communication are traced to the presence of a specialist physician. A valid question raised by this interpretation is whether this difference in communication is attributable to the presence of a single specialist or discipline, or whether there is something unique about being part of an interdisciplinary team that influences communication styles and therefore, outcomes. Lastly, there is the question of whether these results are generalizable. Not all inpatient, clinic-based, or home-based programs, may have the resources to staff an interdisciplinary team and scarcity of fellowship programs limits the availability of dedicated specialist palliative care physicians. Team composition needs to be investigated separately across these care environments. In this short letter to the editor, the authors include information on only a handful of variables (e.g. provider composition of the teams, provider FTE/consult and admission volume, length of stay and average cost savings/day). It is worth considering whether other contextual factors impact the success of any palliative care team, as well as the particular results of this study. This includes provider factors (e.g. gender, years of experience, feelings of autonomy and empowerment) as well as environmental factors (e.g. disease-related characteristics of the patient population, systems-level signs of support for palliative care such as palliative triggers). Additionally, length of stay and cost savings may not be the most meaningful outcome measures for evaluating the success of a palliative care team. Consideration of outcomes from the Measuring What Matters initiative (Unroe et al., 2017), including care consistent with treatment preferences or a global assessment of patient/family experience (such as feeling “heard and understood” proposed by Gramling et al. 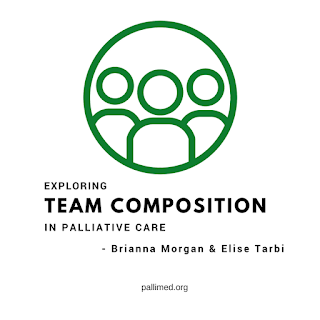 (2016)), may reveal a more complete view of the influence of the palliative care team composition. With mounting evidence highlighting the benefits of palliative care, we agree with Ferrell and Smith (2017) that there is a need to evaluate which practices provide the best blueprint to refine and define the future of palliative care. 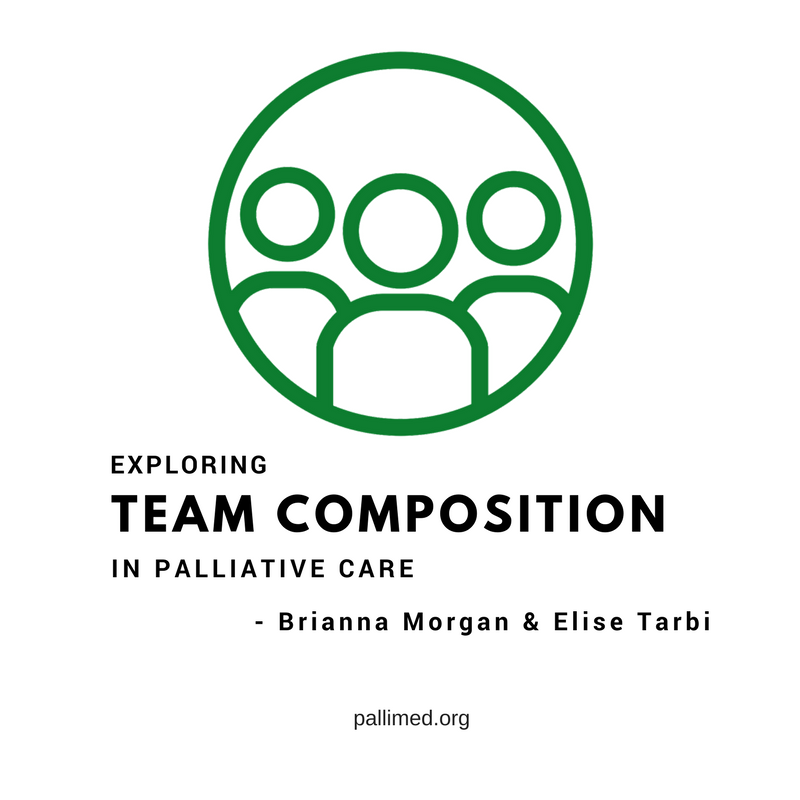 In unpacking the black box of palliative care, exploring the composition of the palliative care team is an appropriate place to start. Determining which metrics best indicate success in which environment will help in identifying teams most suited for the appropriate outcome. Understanding the environment, including the needs and resources of each setting, is imperative in determining which team composition is appropriate for which setting. This will create the type of robust, rigorous regional and national research that is needed to define and refine optimal care delivery models in palliative care. Brianna Morgan, MSN, AGPCNP-BC, ACHPN is a Nurse Practitioner and Palliative Care Coordinator at the Abramson Cancer Center at Pennsylvania Hospital. Elise Tarbi, MSN, AGPCNP-BC, ACHPN is doctoral candidate in Nursing at the University of Pennsylvania where she is studying existential distress. The pair ponder palliative care while running through the streets of Philadelphia with their dogs.